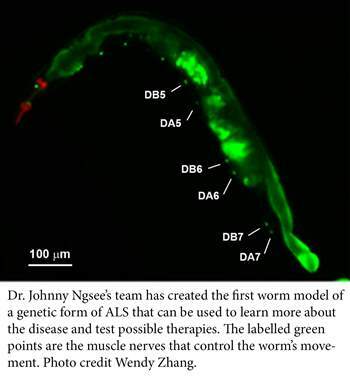 Dr. Johnny Ngsee’s team has created the first worm model of a genetic form of ALS called ALS8 that can be used to learn more about the disease and test possible therapies. ALS, or Amyotrophic Lateral Sclerosis, is caused by the gradual death of the nerves that control the muscles. There is no prevention or cure, and 80 percent of people with ALS die within two to five years of being diagnosed. Dr. Ngsee’s team created worms with a genetic mutation that mimics the disease. In these worms, the nerves that control backwards movement start dying during middle-age. Middle-age is when humans with the disease usually start experiencing symptoms. The team found that treating these worms with a chemical called PIK-93 significantly reduced nerve death and improved the worms’ ability to move backwards. However, the treatment had to be given before the nerves started dying, and had to be continued for the rest of the worm’s life. The team’s next step is to find out exactly what molecular pathway PIK-93 is hitting, and whether it could be made to work shortly after nerve death begins. The results of the study are published in Scientific Reports.